If you can think of anything less cool and hip and high technology than a television infomercial, please write in and let me know. But the ad gurus working for Atari in the mid-90’s thought this format would be a great way to move the Jaguar off shelves. The Jag had already been on the market two years, and in 1995 had Sony’s PlayStation and the Sega Saturn breathing down its neck. Touted by Atari as the first 64-bit game machine, inside there were actually two 32-bit chips called Tom and Jerry connected to system memory by a 64-bit wide data path. This configuration made developing games for the machine difficult, hence third-party games were slow in coming. Meanwhile, the game libraries of its rivals swelled, and Atari discontinued the struggling Jaguar the next year. Hard to see why, with hip and happening advertising like this. C’mon, Bob! This entry was posted in advertising, Atari, console and tagged Jaguar, television on January 5, 2018 by William. The original 3rd-party video game maker for the Atari 2600, Activision apparently saw the writing on the wall in 1983. That was the year they made their move from consoles onto computer platforms, such as porting Kaboom! 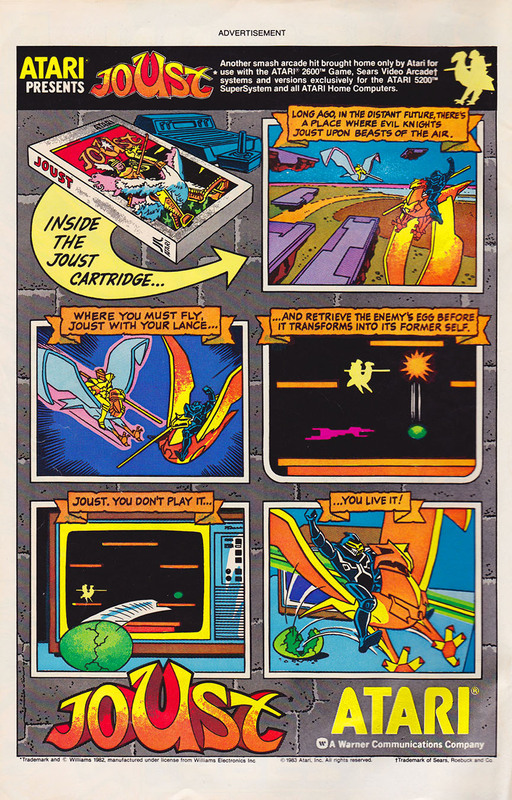 and River Raid to the Atari 8-bit XL line as seen in this ad. Moving to computer platforms helped the storied company survive the big video game crash of 1983-84, allowing them to become one of the biggest video game companies still around today. For more information on Activision and the Atari VCS, consult your local Dot Eaters entry. This entry was posted in 1983, activision, advertising, Atari, Atari 8-bit, computer, VCS/2600 on September 3, 2014 by William. 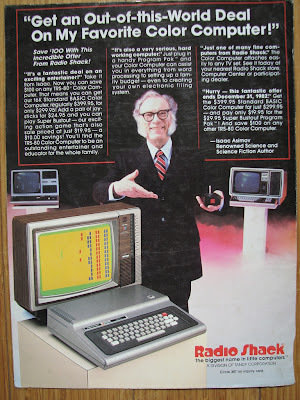 The Ad Game: Isaac Asimov and Some Fantastic Deals! Isaac Asimov. He was one of the most influential writers of our time, having written the Foundation series, along with other SF and non-fiction works, a list of which would be too exhaustive to repeat here. I have a feeling Mr. Asimov didn’t say all those things. It must be a weird thing for an ad copy writer to put words into the mouth of Isaac Asimov, but they give it the old college try here. “An exciting entertainer”? 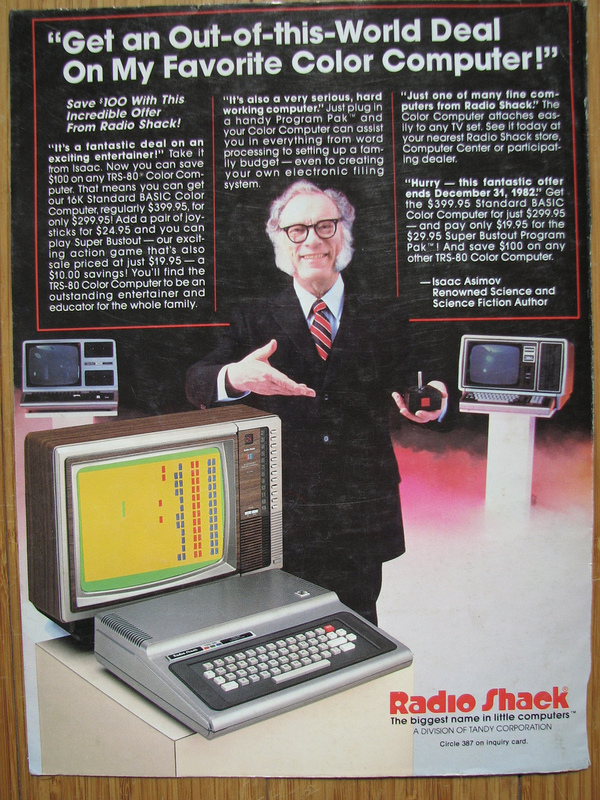 “Just one of many fine computers from Radio Shack”. I also like him holding the joystick like someone just plopped it into his hand, with a rictus grin thinking “What the heck is this thing?”. But still, you have to take it from Isaac. This entry was posted in advertising, TRS-80 on February 2, 2013 by William Hunter. 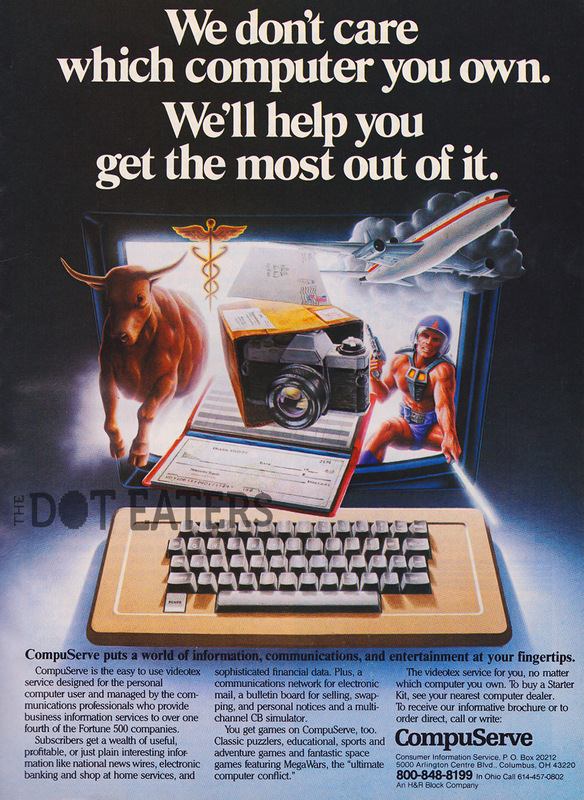 The “videotex” mentioned in the copy was an early system to deliver interactive text to users. It’s funny to me how the base uses of the Internet were all understood and ready to be delivered to a potential user base: news, banking, online shopping, email, games… all the concepts of what we do on the Internet today. Of course, CompuServe has to couch things in a way people of the 80’s would understand, so they compare their chat service to a “multi-channel CB simulator”. 10-4 good buddy! I’m also impressed by the image of a Zardoz-type video warrior armed with not only a hand blaster, but a light-sabre as well. Guy’s ready for a fight! The CompuServe service still lingers on today as a web portal, in a collaboration between it and another prehistoric Internet fossil: Netscape. This entry was posted in advertising, BBS, online on January 22, 2013 by William Hunter. Well, which is it? Long ago, or a distant future? Anyway, I don’t think I want to purchase a game that spits eggs out of my TV screen, from whence evil, sharp-taloned dragons attack me. 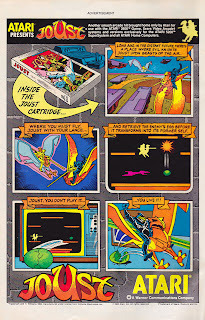 This entry was posted in 5200, advertising, Atari, Joust, VCS/2600, visual cortex, Williams on January 16, 2013 by William Hunter. 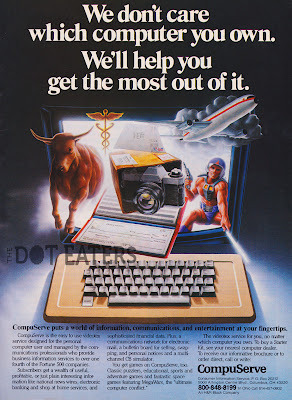 This entry was posted in advertising, Atari, Doom, FPS, id, Jaguar on January 13, 2013 by William Hunter.